Prepping the teachers for Ganitha Kalika Andolana. 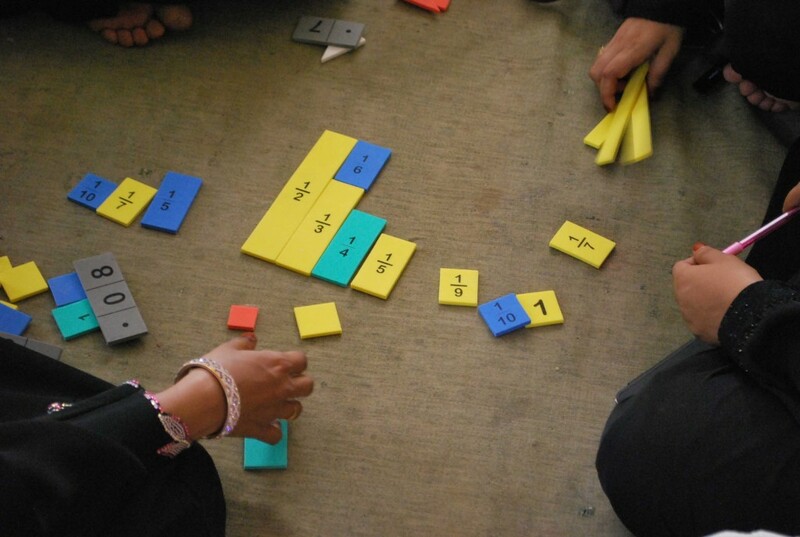 CHANGING THE WAY 3,00,000 CHILDREN SEE MATH. 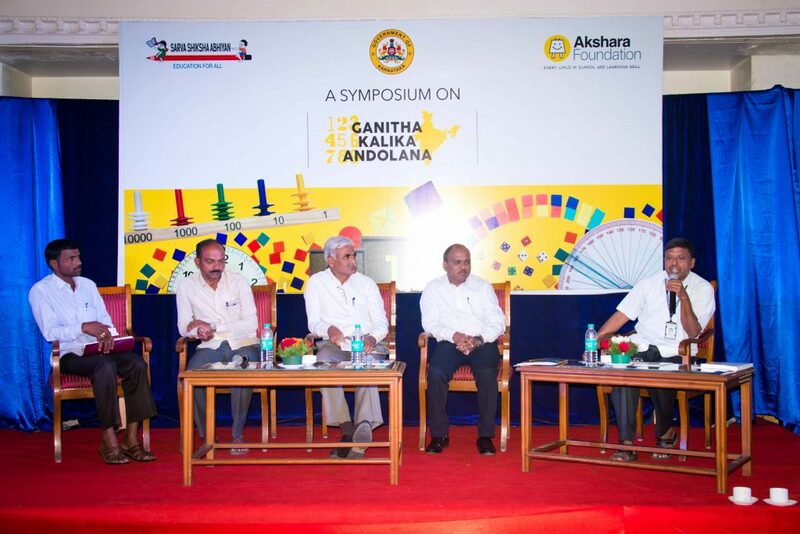 We launched Ganitha Kalika Andolana (GKA) with a lot of gusto, amid even more applause. 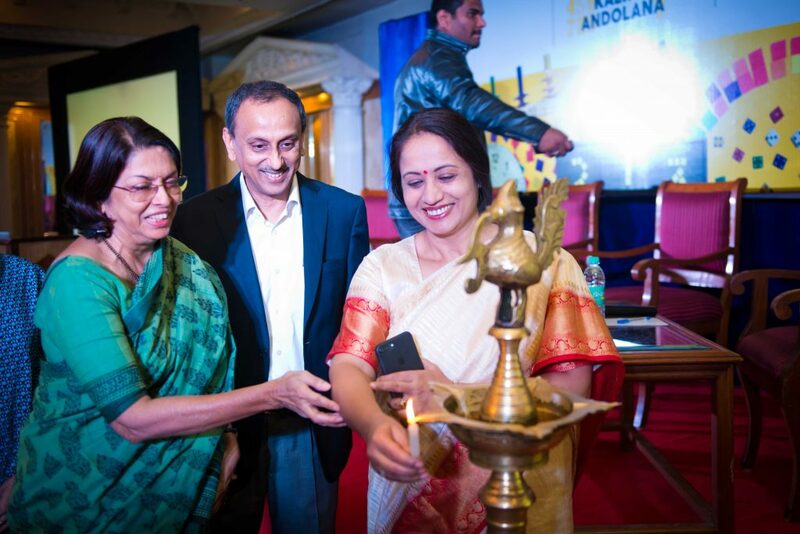 This first-of-its-kind programme in partnership with the Karnataka Government and Sarva Shiksha Abhiyan is going to cover 3,00,000 children in over 7,500 schools. We know what you’re thinking – that’s a huge figure. But for us, it’s just the beginning. Or as we like to call it, Phase 1. Getting a programme like this to be rolled out in six districts was relatively simple. 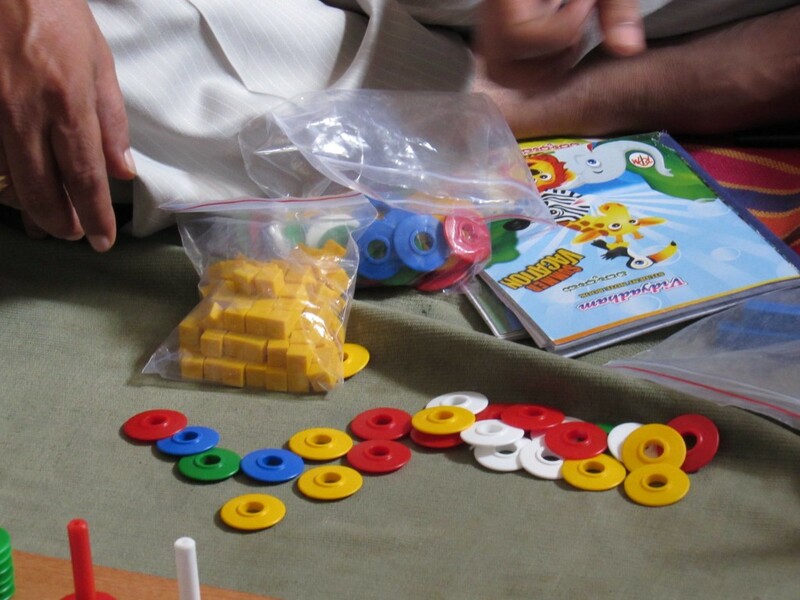 It is getting the children taught in the right manner using this kit – that’s the BIG challenge. When resource people and teachers, the people who are going to spearhead its progress hereon see the contents of the Big Box or the GKA kit for the very first time, they are awestruck and taken aback at the same time. They are torn between a ‘wow’ and a ‘How am I going to use all this and teach math?’ It’s simple, really. With some seriously-intensive training. And no puns intended. Training is an integral part of every new beginning, and is necessary for a smooth transition, progress and therefore, success. Within days of the Andolana going LIVE, all training charts had been drawn up and calls started pouring in. Everyone seemed keen on getting this show on the road. There are three levels to the GKA training programme. 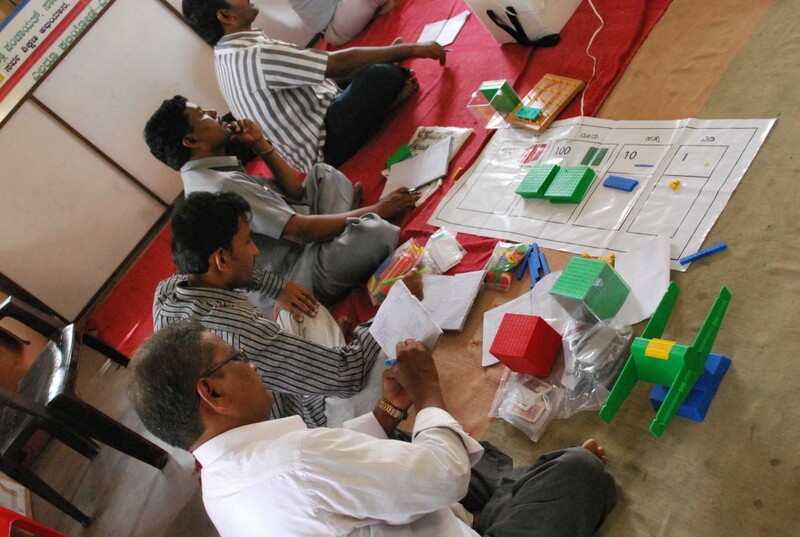 The first level was training given by Akshara Foundation to the Master Resource Persons. The second was a 3-day session exclusively for Cluster Resource Persons (CRPs) and experienced teacher trainers from all clusters, trained by Master Resource Persons of Akshara Foundation. From 23rd June to 30th September ’15, out of 1,400 resource people to be trained, we covered 1,280 – about 120 CRPs have yet to be assigned to their clusters by the state education department. Hardly had they been trained, they were eager to begin the 3rd round of training immediately. 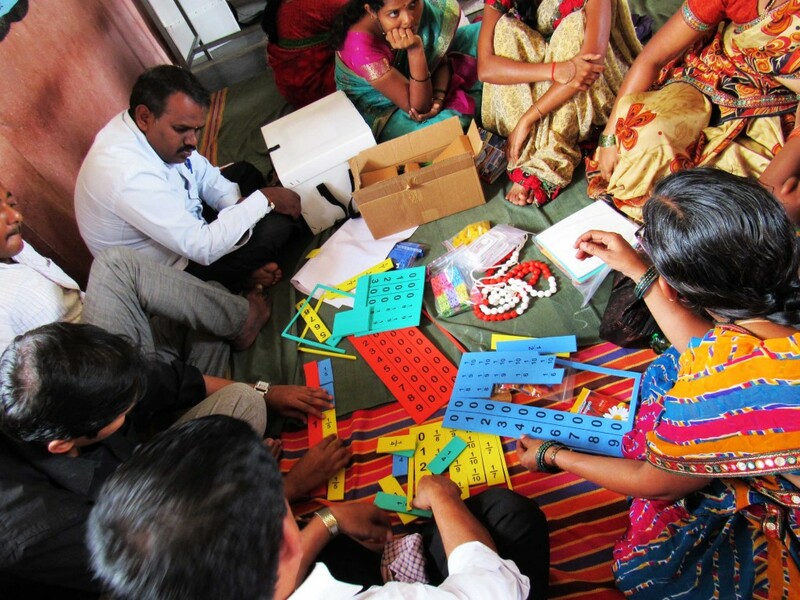 For instance, within a few days of their training, the resource people at Devadurga waited impatiently for the kits to arrive. The minute they did, they fixed the 23rd of July to kick-start the teachers’ level of training. The third and final round will see these CRPs transfer their knowledge to the 8,300 teachers of the government primary schools in all districts. 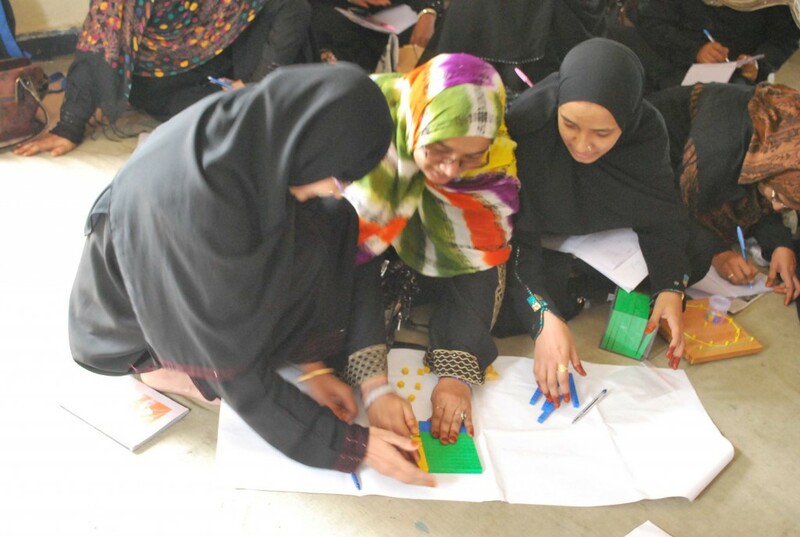 And as of 31st July ’15, around 684 teachers have already been trained. 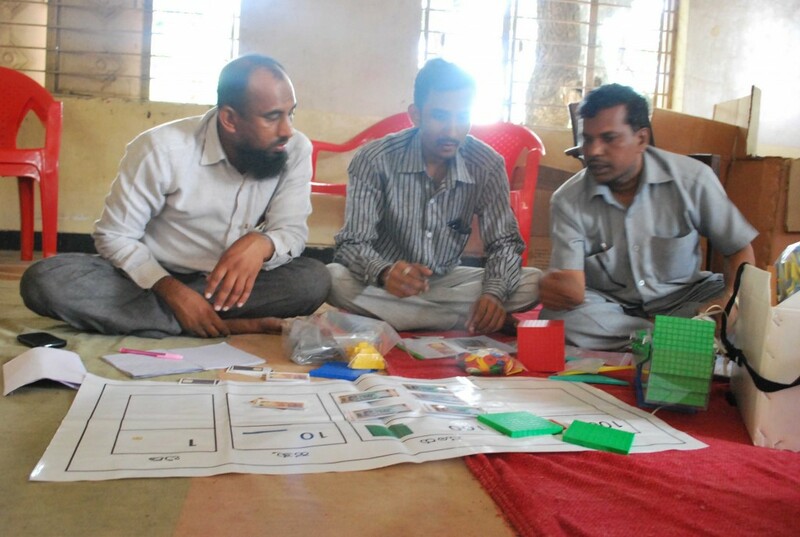 We visited a 2nd level training programme in Urdu, at Gulbarga and could not help but share our experience. A group of 30 uncertain looking people slowly trickled into the classroom, unsure of what to expect over the next three days. 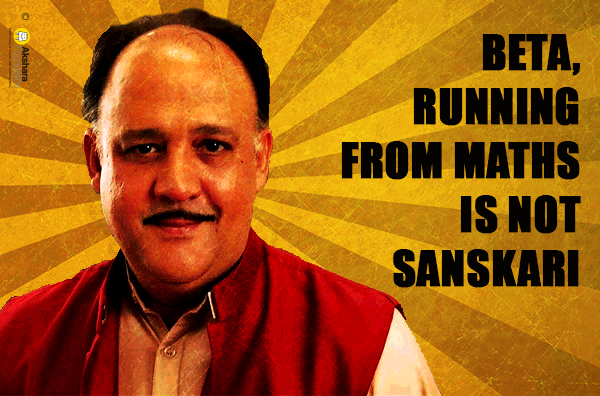 They all had one common expression – why in the world was Akshara teaching them basic math? The group was trained by Mr. Deshpande and Mr. Kulkarni, retired educationists who were first trained by Akshara Foundation. Nothing could have braced these 30 for what was about to hit them. 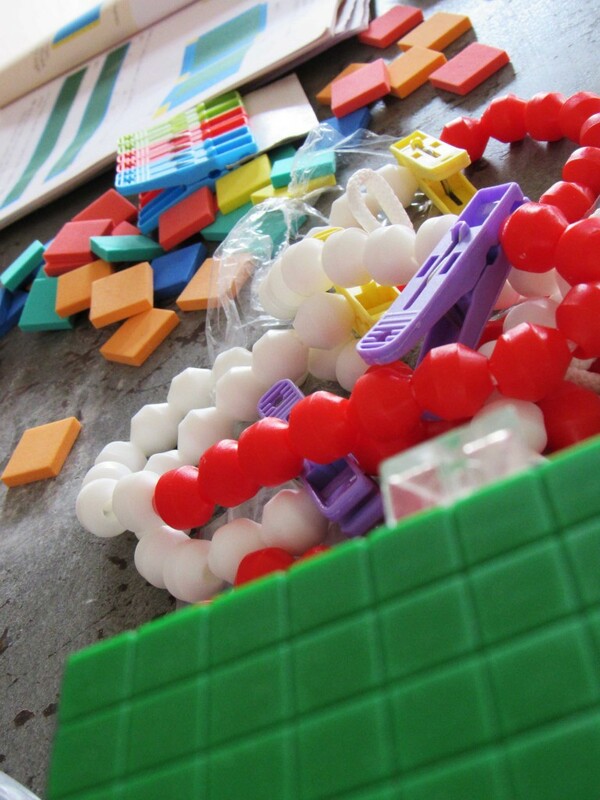 Out came the blocks, foam squares and beaded ropes, to explain how they could be used in Addition and Subtraction. And with that, their eyes started widening with interest. Addition and Subtraction later, the group was hooked. They could not peel their eyes away from the board. Frantic notes were being taken, questions fired, things being pulled out of the kits to see how they could do it on their own. 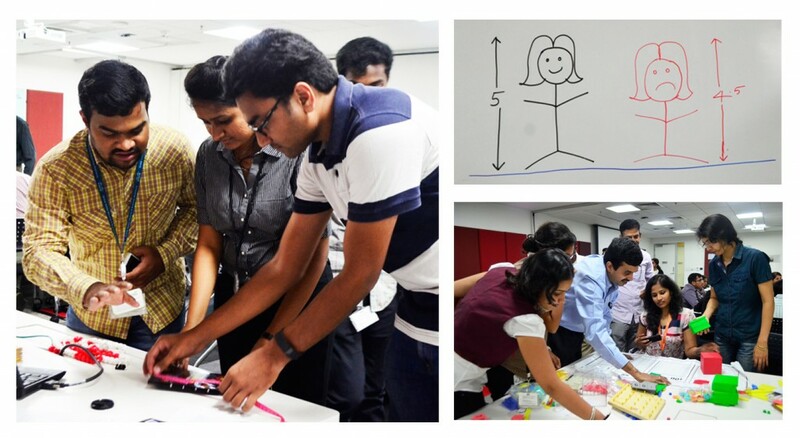 It was chaos, fun and learning, all rolled into one roller-coaster class. This was followed by multiplication, division, fractions… slowly every one of the 21 items were used to cover the entire 4th and 5th standard syllabi. After each concept, they kept exclaiming if it could interest them this much, imagine how the children will love this way of learning. They were busy solving math problem after problem, using element after element. The paper money, base 10 blocks and foam squares seemed to catch their fancy the most. It was amazing to see how they had all become children in class all over again, learning to love math the way it should be loved. And this is just one such success story, from one of the training programmes. Imagine the sheer magnanimity of this movement when all 8,300 teachers and 1,400 resource people join in as enthusiastically! Check out our entire album on the 2nd level of training sessions. I am afraid a lot can happen if I start using the big white Math Box. 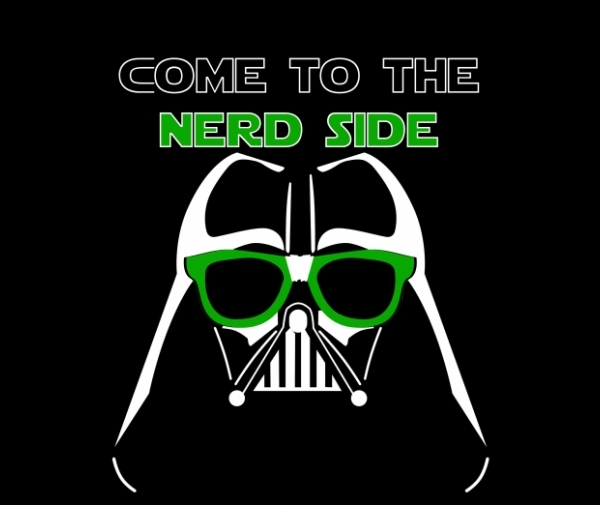 Sport is fun, science is nerdy, math is tough. That’s the stuff of legends on which I have been brought up on. For 30 years now, this legend has stayed with me and in many ways I have nursed it – let it grow and insidiously seep into my pores. It’s only a year ago that I experienced a slight shift in the status quo. 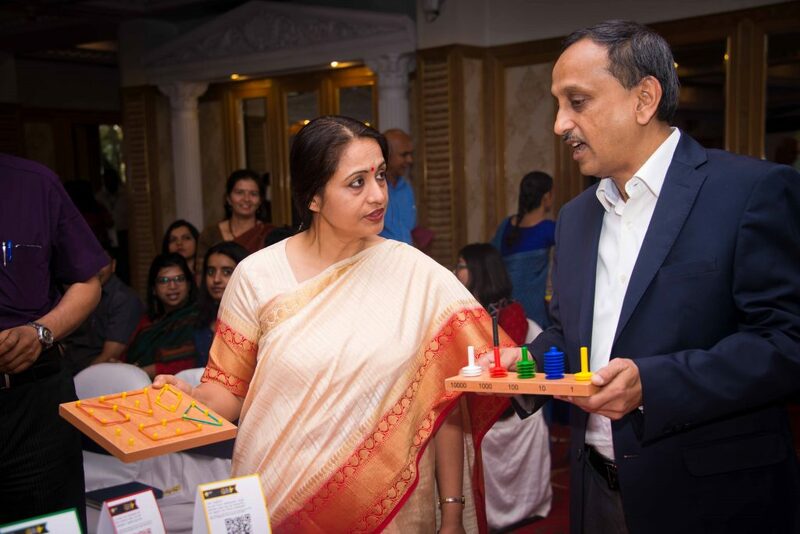 Thanks to my work with a non-profit Akshara Foundation and Ganitha Kalika Andolana – a programme aimed at breaking barriers to math learning and making it more fun by using creative teaching aids. All this and much more, put together in a big white math box. 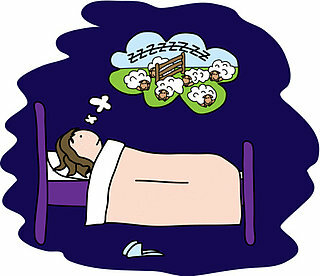 I may actually be able to count sheep and sleep like a baby. 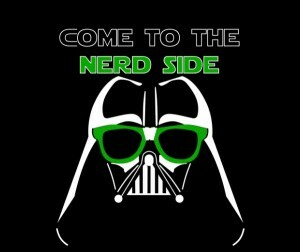 Make friends with nerds, see them in a positive light. 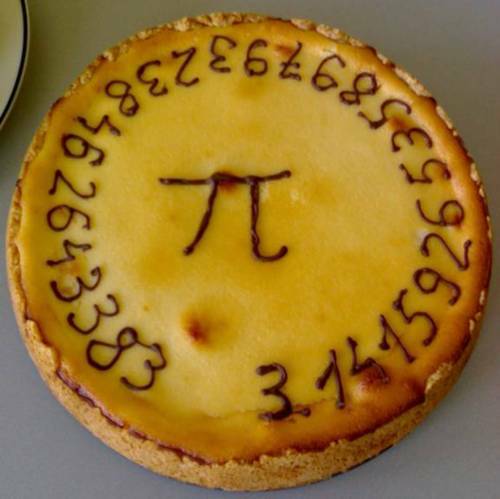 Have my Pi and eat it too. Even cook my pie to perfection. 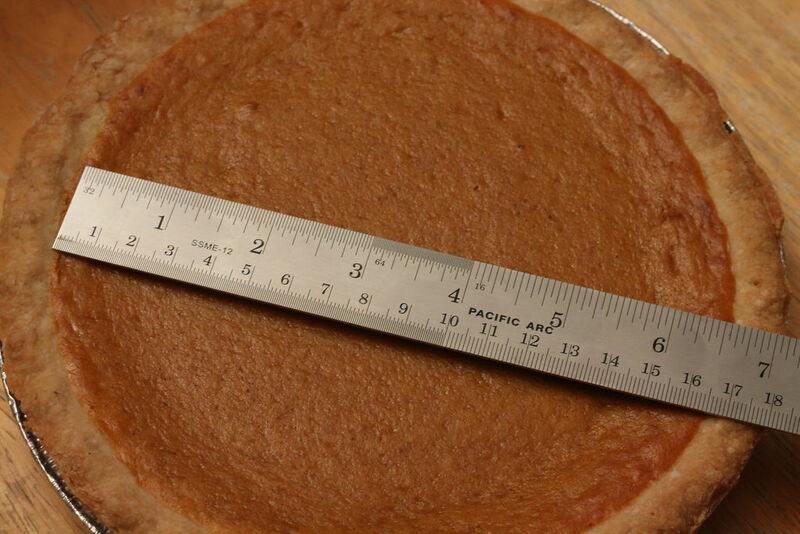 Great recipes always involve right measurements. 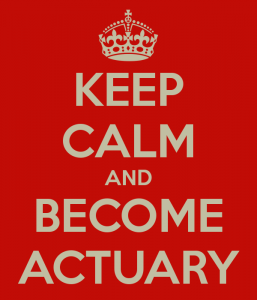 Become an actuary, insurance underwriter, stockbroker, an economist and not write this. 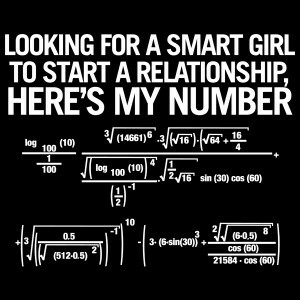 Increase my chances of finding the perfect partner. 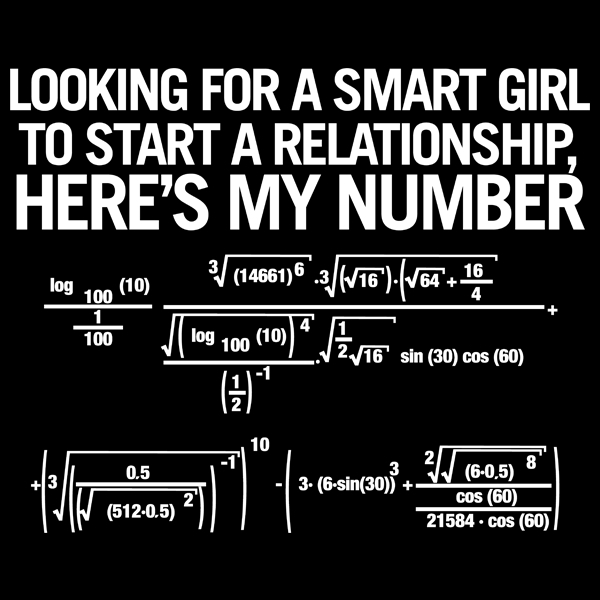 After all according to Hannah Fry, finding the right mate is nothing but mathematics of love. Indulge in some form of exercise without getting sweaty. 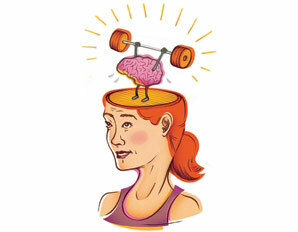 I am told doing math, stimulates and exercises the prefrontal cortex in one’s brain. For once there will be no shades of grey…it’s all black or white, right or wrong. Not to forget 50 is just a number. 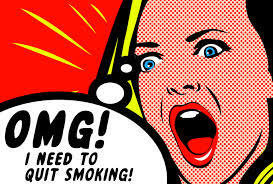 I can calculate the odds of quitting smoking. I may finally think of making truce with math and bury the hatchet. High Five! Wondering if all this can really be possible by using a big white math box? To keep in touch, do join us on Facebook or follow us on Twitter. All the images used are for non commercial, social-good purpose. 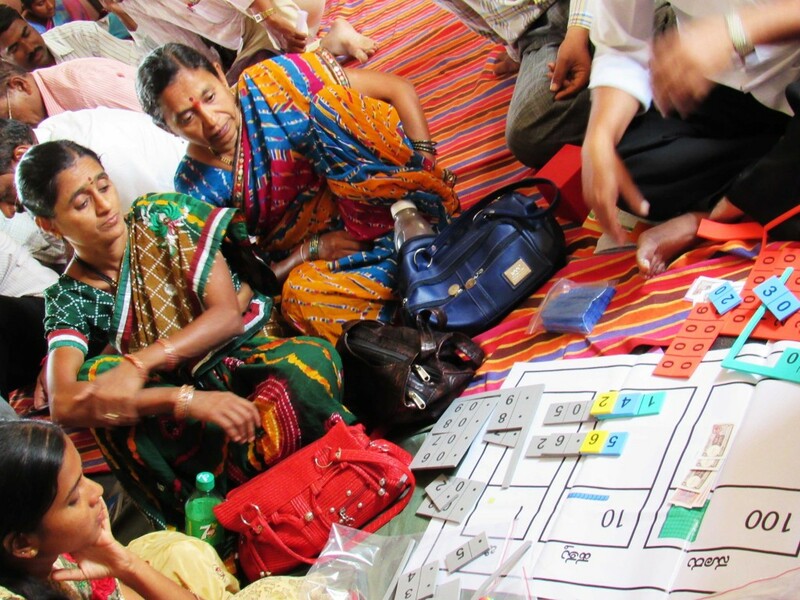 They are sourced from various online resources and can not be credited to Akshara Foundation. We recently pulled out all the contents of Ganitha Kalika Andolana’s big White Box for you. It has a beaded rope, tape, blocks, foamed goodies, measuring tools, and weighing balance etc. In a nutshell, everything a child needs to understand every Math concept in his/her syllabus. But explaining each concept is no nutshell of a job. It’s creative, challenging, easy and tough, all at the same time. Which is why, we decided to come up with as many ways as possible for the teacher to use as ready reckoners, while teaching Math. 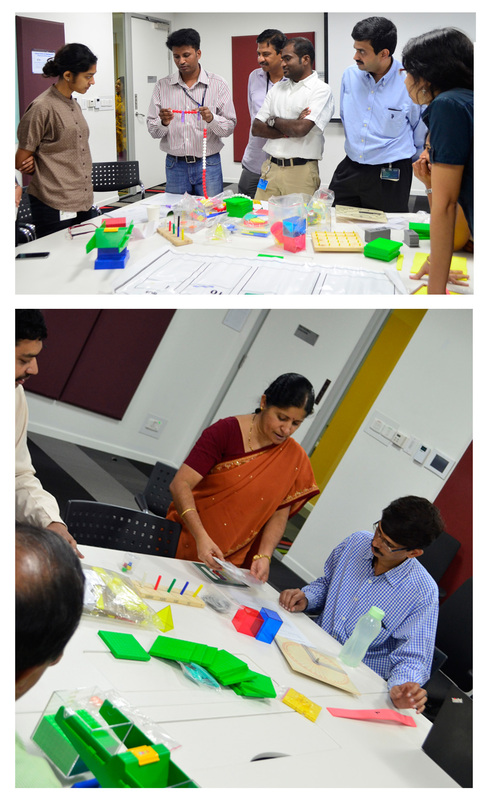 And what made it better, our friends at CISCO Bangalore, decided to huddle together one day and brainstorm for us. Eager yet cautious faces greeted our entire team, as we began the fun afternoon. The sheer magnanimity of the things being pulled out of the box seemed to deter them at first. But once they got the hang of the entire kit, the place was abuzz. The entire group was divided into three large groups. 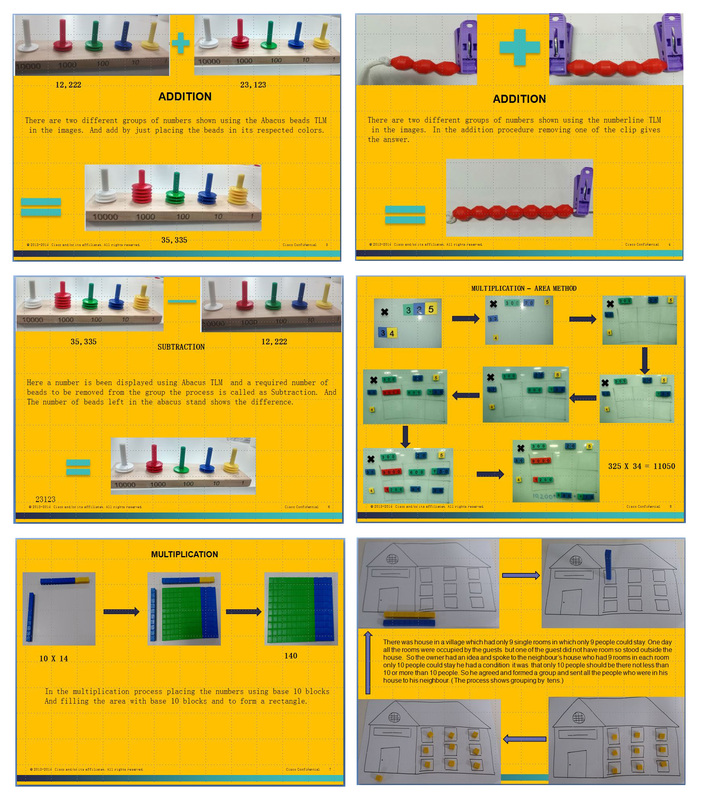 Team A had to come up with pictorial representations for addition, subtraction, multiplication, division and number counting using the abacus, beaded rope and base ten blocks. Team B got Fractions and Decimals, while Team C tackled Geometry. What followed was a few hours of excited squeals, quiet pondering, hushed discussions and noisy exclamations. 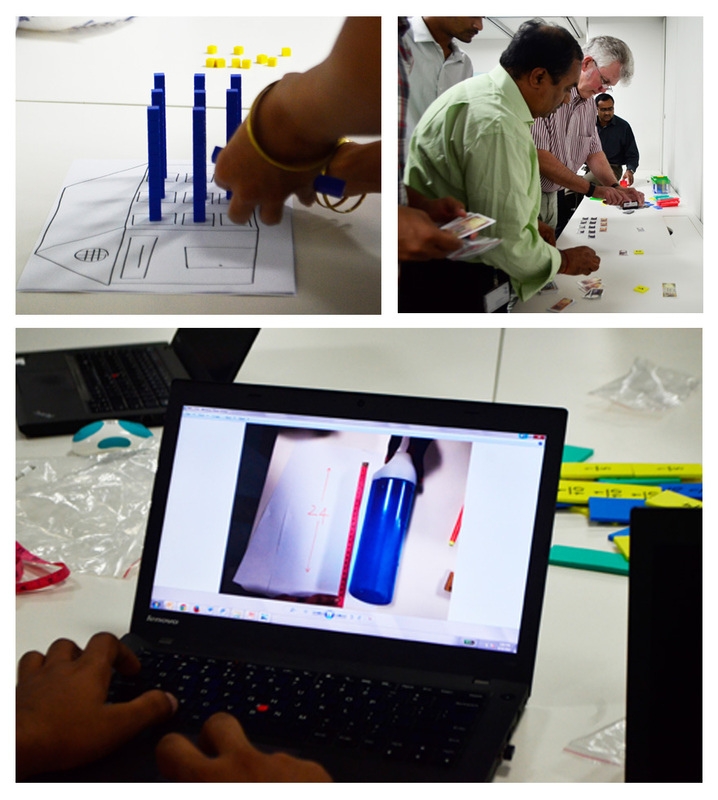 Each team further divided themselves, so that they could come up with as many representative options as possible. “It’s the most interactive session we have ever had” said Blessie, the chirpy and ever helpful team member of the CISCO volunteer team. “But a lot of the credit also goes to our leadership team. They push us a lot, “ she added without being able to pry her eyes away from the coloured blocks. And the most exciting part for us was the fact that we actually got a great number of options to choose from, at the end! Soujanya, who has been interning for around 5 months was a little intimidated with the colourful yet unknown things overflowing from the white box. “It took us a while to get the hang of how different things are used, but on the whole, very interesting.” And so she continued adding the finishing touches to her group’s presentation. A brainstorming session of this kind was an excellent way for this enthusiastic bunch to also experience the Math kit first hand. And a lot of them actually realised how challenging it is, to think at a 4th grade child’s level. As the session drew to a close, the teams got busy documenting their ideas.The last team that remained was a particularly interesting one. Khyati from that team, who has been with CISCO for a couple of years now, is from a government school herself. You can see how the entire afternoon spanned out here. 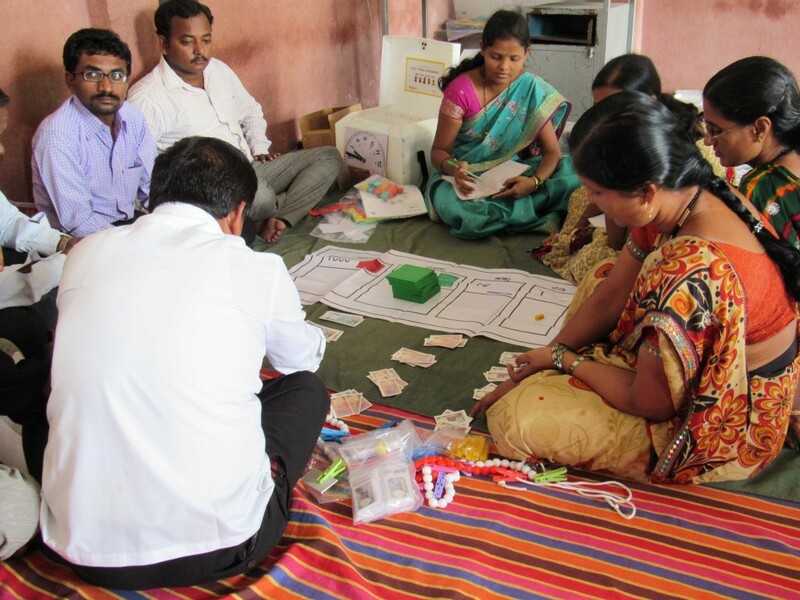 In a relentless effort to monitor and propel the programmes, Akshara’s resource group and field teams are checking on progress and learning achievements and also capturing experiences from Hoskote, Devanahalli, Kushtagi and Mundargi Blocks. In Kushtagi, where stumbling blocks have been more in evidence. Delays in training have impeded the programmes in this Block, and yet, there are outstanding examples of teachers striving ahead, regardless. There is a method to monitoring. Schools where the programmes are running are classified as ‘A’, ‘B’ and ‘C’. 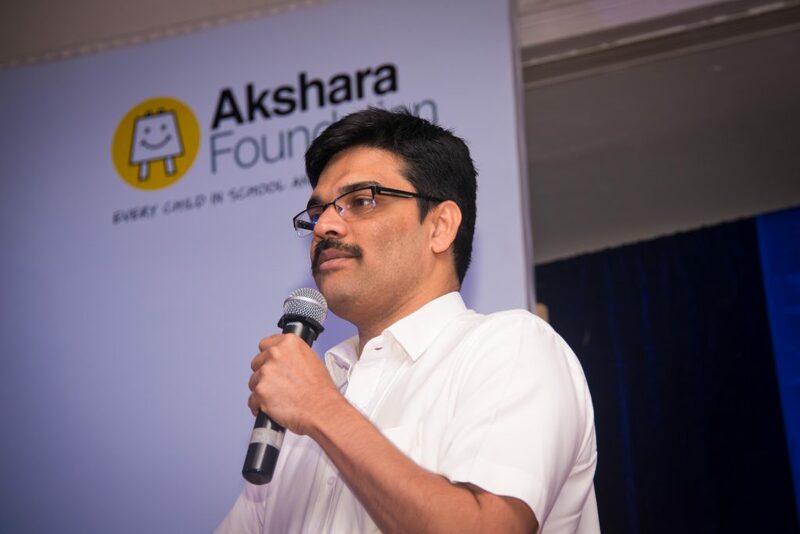 It is an internal Akshara ranking that helps distinguish between quality schools and poorly performing ones. ‘A’ grade schools usually have bright children fighting competitively to answer questions the visiting Akshara teams ask them. 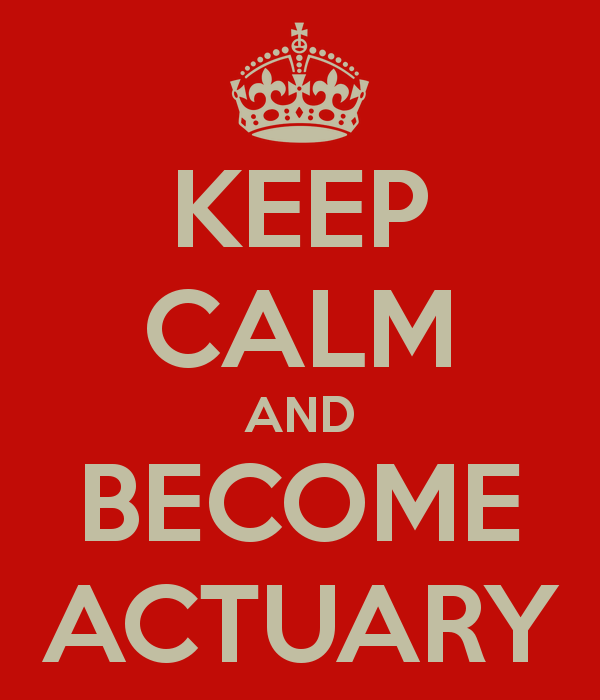 They are smart, not to be outwitted by what they do not know, quickly clearing doubts and carrying on. In ‘B’ and ‘C’ schools there is markedly less enthusiasm. 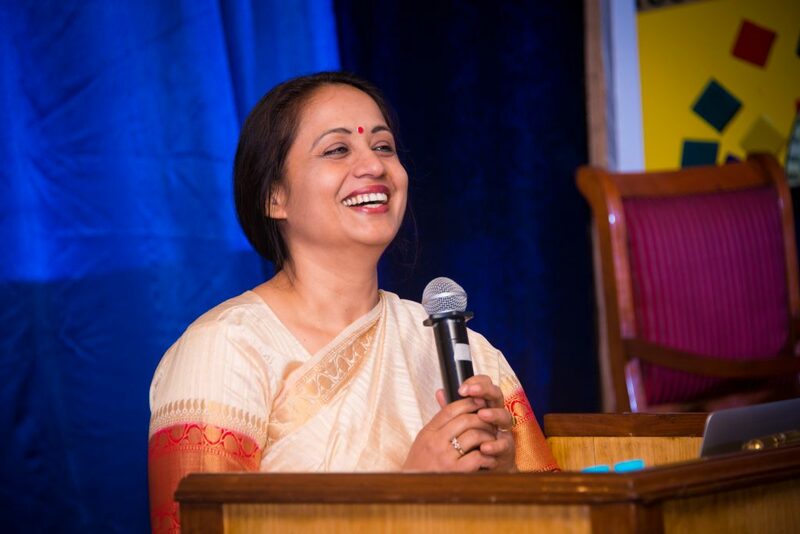 In the former, children have seen the Akshara teaching-learning material and know how to use it, but need practice before they can become competent. In ‘C’ grade schools children have seen the TLM, but are not aware how to operate it. The method eludes them. It is difficult for visiting teams to ask teachers directly if they are following the programme methodologies. It would seem like an affront, a doubt cast on credibility. 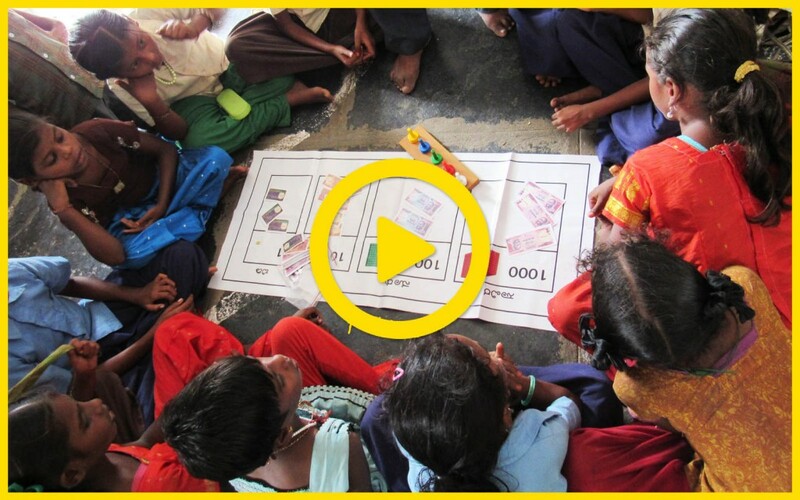 Akshara teams take up the TLM with the children instead and estimate what they have been taught, and how. The resource group from Bangalore visited 13 schools in Kushtagi Block. The 3 Urdu medium schools among them were non-starters – the programmes have not moved. The excuse was that training was delayed. 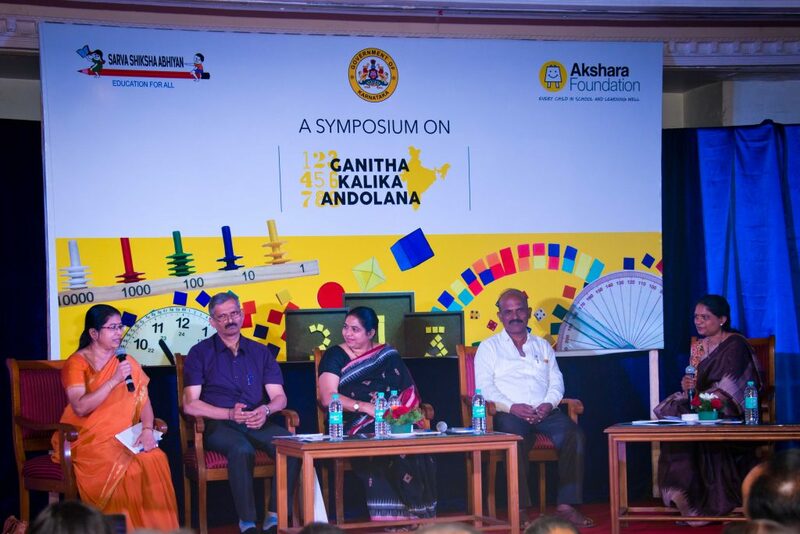 But the 10 Kannada medium schools of ‘A’, ‘B’ and ‘C’ grades were more invested in the programmes, teachers taking them forward despite the tardiness and, sometimes, the lack of training. The Cluster Resource Person (CRP) of the Hiregonnagara cluster is an active promoter of the programmes. 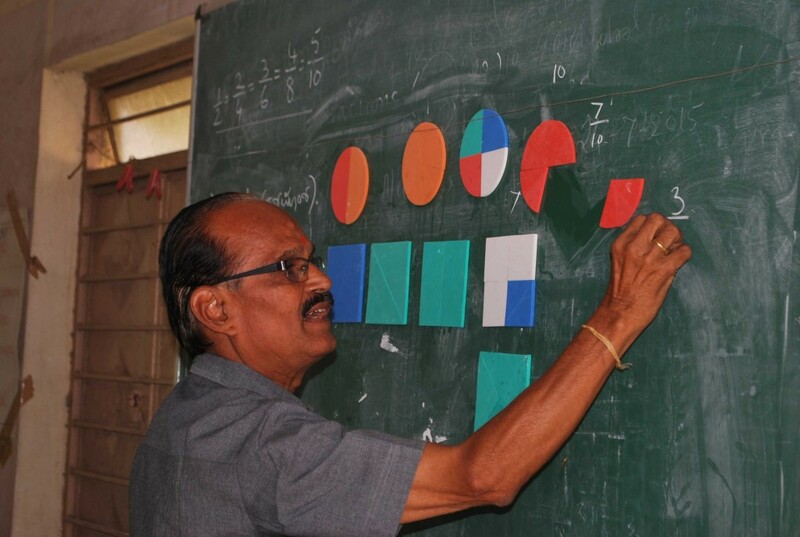 At the Samalochana Sabhe Saranabasiah Kolli organises every month for the teachers under his watch, he tells them that the English and Mathematics programmes are good, that they will not experience any difficulty if they follow the Akshara TLM. It will be so easy, he tells them. 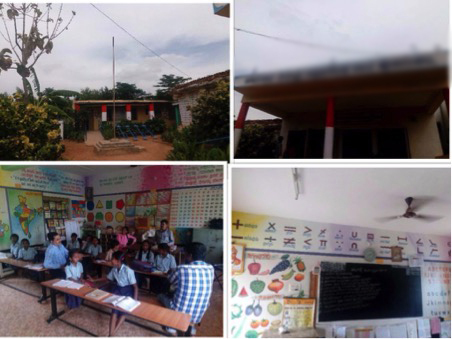 At the Government Kannada Higher Primary School (GKHPS), Habalakatti, the resource group was in for some big experiences. It has 298 children and classes from Std. I to VIII. SaranabasiahKolli was there telling the team that he was getting a definite sense of the programmes benefitting children. Mainly because of an inspired Std. IV English teacher who is a Master Resource Person chosen by the Department of Education for his proficiency, and trained by Akshara. The children engaged the resource group in conversation by asking them their names. They could identify the parts of the body and point to their functions and rattled off fluently the names of twenty six vegetables, all in English. They even made sentences with them. The results are obvious, the resource group says. The children are gaining a foothold in English. 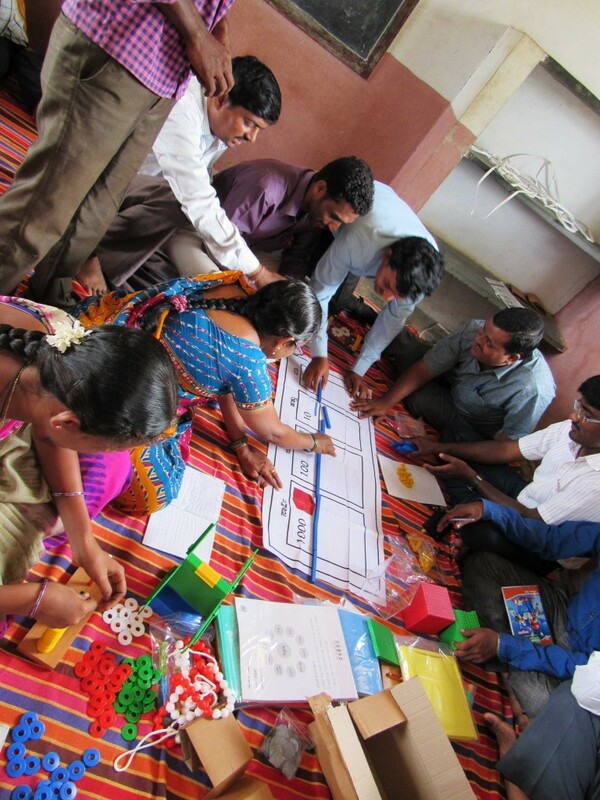 The resource group came across another inspired teacher at the school – Rajani of Std. IV. She has not received training in Mathematics. 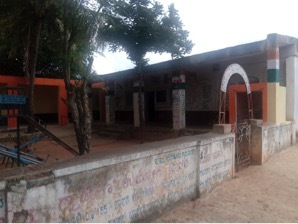 The team could not ascertain why and conjecture that perhaps it is because the school feels there is a lead teacher in Santosh, or it is because Rajani was needed as caretaker teacher when the others went for their training. Her attitude, however, was immensely positive. She was not unhappy about it. Akshara’s Mathematics Teacher’s Manual and the TLM are her daily guide in class and SaranabasiahKolli is always motivating her to follow it. Even if no big impact can be seen, the resource group is full of appreciation for her ongoing efforts. The team’s conclusion is: Though some of the training in Kushtagi Block took place only in December 2012 and January 2013 due to factors beyond Akshara’s control, teachers who are interested and motivated have made significant progress in the relatively short period of a month or two. The syllabus is being covered by linking the TLM to what is being taught. Solutions are being found through the TLM for doubts that arise from textbooks. 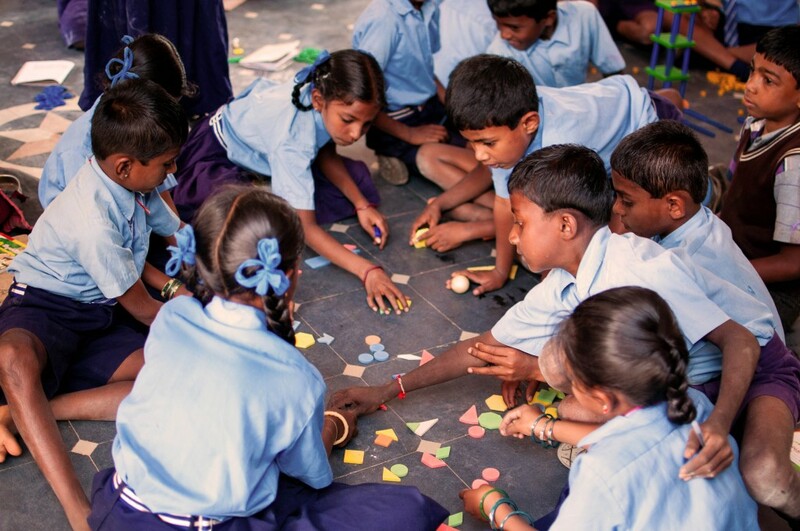 This breed of teachers says that the programme-prescribed group work is an effective strategy and that children do their work on their own even if they happen to be absent.